Graduated from The Healing Touch Therapeutic MassageCenter located in Rochester MN in the summer of 2001. While studying under Jack Baker in 2002, James received certification in Neuromuscular Therapies one and two from Windemere Institute of Healing Arts located in Iowa. 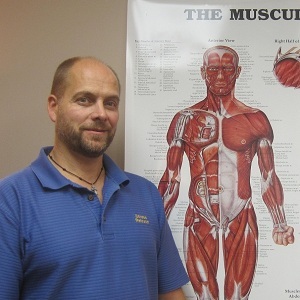 In 2003, while studying under Tom Woloshyn, a noted Holistic Health Practitioner and Consultant from British Columbia, James received a certification in Vita-Flex Bodywork, Color Therapy and Nutritional Therapies. In 2005, while studying under Michael Bodine, James completed a ten session course in Structural Integration. In January 2007, James attended a five day intensive course on Orthopedic Medical Massage at Concordia College taught by noted international lecturer, practioner and teacher, James Waslaski. To teach each individual person about themself, and to share information they can use to improve the quality of their life.